You might have several social media campaigns in place, but have you ever wondered how effective they really are? It is highly likely that you currently have multiple social media campaigns that require a lot of your time and money, but how do you determine when it is time to pull the plug on a social media campaign or if you just need to improve it? A good social media campaign should coincide with activity on your social media page. Followers should be talking about you, your products or your business. If there is a clear lack of these things on a specific social media platform, it is time to evaluate its usefulness. In order to evaluate this activity, it is necessary to check the number of likes, shares, retweets or any other follower activity that could be an indication of success or failure. If you social media page fails to engage your target group, it could be bad advertising for your company and a waste of your valuable time. Another way to evaluate the effectiveness of your social media page, is by monitoring the traffic you get on your website, more specifically the traffic you receive through your social media page. Traffic is not the only thing though, valuable traffic is what you need to look for. Have potential clients from your social media page actually bought your service and/or product? Have they subscribed to your newsletter? No matter the goal, buying and interesting customers is the ultimate goal of any business that goes on social media. Is your platform suited for your target group? It is possible that you have an excellent social media page, but are not getting any customers. The reason for that is usually a lack of interest in your product or service, which could point to the fact that your desired target group is not present on the social media platform you are currently using. If this is the case, you might want to switch to a platform suited for your target group. Each social media platform has its own age group, including people with very specific interests. Even though Facebook has the largest pool of target groups, there are some exceptions. If you wish to speak to a younger generation, it might be a good idea to expand to Instagram as well. If your aim is focussed on attracting valuable business contacts, then LinkedIn will cater to your needs. Doing some research on the social media platforms and the specific target groups that use this platform will make a huge difference. It also means that you can focus on a specific social media platform, saving you loads of time since you won’t have to mess around with multiple accounts on various social media platforms. You may have an account of various social media platforms, but are you publishing content that your target group finds interesting? Plain text is no longer a good idea, because the majority of internet users like visuals, including images and videos. Videos are becoming increasingly more popular, so it is worth jumping on that bandwagon. Some companies will find it hard to create a video, especially when you’re in a profession that isn’t that creative. If this is the case, you can always showcase you professionalism or even the facilities you have at your disposal for the execution of your profession. No matter what you choose, ensure that it will interest potential clients. If you have a creative profession, for example graphic designer or interior designer, images will be your new best friend. Join a social media platform that focusses on the use of images, for example Instagram, Pinterest and Tumblr. Post some photos of your most impressive work to date and notice how much exposure your business will get. When you’re on social media, your goals can become unclear fairly quickly. There are so many things to take advantage of, from advertisements to getting a large amount of followers. Setting some goals in advance will help you stay on track. Informed choices can be made by setting clear goals. If your purpose is SEO, it is better to go with Google Plus, but if you want more customers in your store then Yelp is the obvious choice. There are dozens of social media platforms, so making your choice may prove difficult. Depending on the target group you are trying to reach, there are five social media platforms that are currently booming with potential clients. Facebook is the biggest social media platform at the moment and it seems like it will stay that way for quite some time. The Facebook community has almost every target group available, but also demands time and effort to be effective. The Facebook platform will showcase your company to a wider public than any other social media platform. Facebook also enables you to create relevant posts, share images and even videos to engage customers in conversation. The platform also offers various methods for advertising and these are usually more beneficial than adding a promotion on your business account page. Unfortunately, popularity also means more competition. Many people have hundreds and even thousands of friends, which can cause your posts to get lost between all the others. If you are serious about showcasing your business on Facebook, you need to spend an incredible amount of time to promote it there. You can get the most out of Facebook, but you might want to consider hiring someone to manage this social media platform for you. If you have a younger target audience, then you’ll need a business page on Twitter. The social media platform is also quite large, coming second after Facebook. Twitter is perfect for making announcement and for a nice freebie. There is a downside to Twitter though, since all your messages have a character limit of 140 characters per Tweet. It means that you’ll have to try to convey your message a short as you can, possibly leaving out some relevant information about your company. You can always counter this by creating an attractive Twitter page with relevant information about your company displayed on the profile, but there is always a high chance that this information will be missed. Twitter is a quick platform where people go to for quick news. Many businesses can take advantage of this, but if you aren’t equipped to provide quick replies and converse with customers multiple times a day, then Twitter might not be suited for you. You can always hire someone to manage your Twitter account, but this can increase the price of your advertising and is not ideal for businesses that are just starting up. Professionals looking for valuable business connections and who are aiming to network, will be right at home on LinkedIn. The social media platform allows you to create a professional profile with certain skills that others can endorse. LinkedIn gives you the opportunity to participate in various groups and discussions related to your business and therefore you can showcase yourself as an expert in a certain field. This means that this platform can provide you with valuable business contacts and potential clients from all over the world. Unfortunately, like any other social media platform, there are also some disadvantages to the use of LinkedIn. The social media platform is mainly suited for businesses that offer services, instead of products. Web designers, writers and even lawyers will find LinkedIn a good investment, but e-commerce businesses will find it of little use. People with a creative profession or occupation need to take advantage of Pinterest. This social media platform is solely based on the publishing of images, creating an attractive medium for many people. An interior designer, for example, can easily post a picture of his latest job and impress many users. However, there is also the other side of the coin, because professions that are not so creative cannot take advantage of this platform. Posted images should be outstanding and grab the interest of users. Then there is also the fact that many users on this platform are female, resulting in popular categories such as food. Not everything should be seen as negative though, people with a creative profession that have women as their target group will find gold in Pinterest. YouTube was only recognized as a social media platform recently. Many people have witnessed the increase of videos on the internet and discovered new ways to promote their business through video. YouTube also has his own video-editing software, making it easy for you to upload, edit and reel in the results. If you are able to make a creative, interesting and engaging video, it also has the chance to go viral, creating a massive buzz for your company. People that don’t have creative professions, might encounter the same problem as with Pinterest. It is really difficult to create a video for an everyday profession, for example translator or lawyer. What you can do is create a short introductory video of your company, but there is no chance that it will go viral. Another disadvantages to YouTube is the amount of competition you’ll encounter. There are thousands of companies that are currently jumping on the video advertising bandwagon, making it increasingly more difficult to stand out. However, if you have the time to make frequent video posts and if you have an interesting message to share with the world, you have a good chance of generating some traffic from YouTube. Tumblr is not as popular as Facebook and Twitter, but it still speaks to a broad audience. This social media platform gives you the opportunity to create blogs, leaving loads of room for information about your company. The beauty of Tumblr is that it can speak to a niche market, for example, if you design model airplanes, you will find a following for it on Tumblr. However, Tumblr is also a very visual platform, so if you decide to start on this social media platform, you will need interesting images or videos to go with your blog posts. The most original posts usually stand out for the rest, so the more creative you are the better. Instagram is not as popular as it used to be, which causes many businesses to step away from this platform. However, Instagram still has a huge following of younger target groups that are perfect for businesses trying to reach a younger crowd. However, Instagram is solely based on images, so you’ll need to post pictures quite frequently. The topic of your pictures is endless though, especially when you run a business that is directed towards a young niche crowd. Social media marketing is not as easy as it used to be. There are dozens of new social media platforms coming out each year and it becomes harder to predict which ones will be successful. At the moment it is better to go for the established social media platforms and only consider another platform when it starts to become a trend. However, there is an additional problem we face when we decide to handle social media marketing. This problem is time. Many business owners simply haven’t got the time to go on multiple social media platforms. If this is the case, you can always hire someone to handle social media for you, but sometimes it might not fit the budget. When your budget does not allow hiring a digital marketer, you’ll need to focus on one social media platform only. 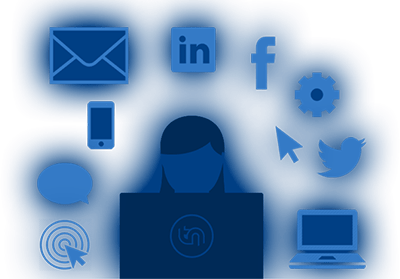 You’ll also have to choose your platform wisely, more specifically a social media platform where you can reach your target group in the most effective way and that requires a minimum amount of time manage. If you cannot hire someone to help you with social media, you can already rule out Twitter. This platform is too quick to handle alone, but you can still choose Facebook, which can be managed easier.